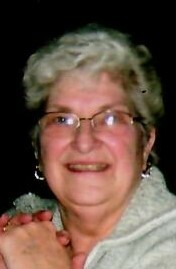 Alice Marcia Eleck Szinyei, 80, of Torrington, CT, died Friday, January 25, 2019, surrounded by her loving family. She was born in Norwalk, CT on December 3, 1938, daughter of the late Andrew and Rose (Bernhardt) Eleck. She was a 1956 graduate of Norwalk High School and a member of the National Honor Society. Her favorite job was being a loving wife and mother, raising her family in New Milford, CT. Alice enjoyed spending time with her friends and family. She was active with the Torrington Senior Center, was on a bowling league, liked to garden and especially loved to quilt. She, along with the members of her quilting group “Fabric Friends”, helped construct and present several Quilts of Valor. She was a communicant of Trinity Episcopal Church. She is survived by her loving husband of 62 years Daniel Szinyei, her daughters Laura Biro (Larry) of Oakham, MA, Dana Mohlenhoff (Peter) of East Canaan, CT, Sandra Hutchison (Kent) of Suffield, CT; her brother, William Eleck (Gail) of Whitingham, VT; grandchildren, Andrew Biro (Kristina) of Sterling, MA, Kathryn Biro (John Motto) of Muncy, PA, Daniel Mohlenhoff (Krystal Harris) of Reading, PA; one great grandchild, Elizabeth Maty Biro of Sterling, MA. Funeral Services will be held on Thursday, January 31, 2019, at 1:00 p.m. at Trinity Episcopal Church, 220 Prospect St., Torrington, CT. Relatives and friends are asked to meet directly at the Church. Burial will be private at the convenience of the family. Calling hours will be held on Wednesday, January 30, 2019, from 3:00 p.m. to 7:00 p.m. at Cook Funeral Home, 82 Litchfield St., Torrington.